Being Frugal and Making It Work: Strong Expandable Garden Hose Set ~ The Perfect Hose for all of Your Needs! Strong Expandable Garden Hose Set ~ The Perfect Hose for all of Your Needs! It never fails... every single time I go to mow the lawn, I have to role up at least two or three garden hoses. It seems like everywhere I look during the spring and summer months - there is a garden hose strung out across the yard. I was recently introduced to an amazing expandable garden hose that easily compacts itself and will fit inside a small bucket! The Gardspo garden hose is just the thing I have been looking for! I also love that this garden hose is easy to use and pull across the lawn to where it's needed! We have dogs and cows that need to be watered, trees, flowers and a garden, and a kiddie pool. Oh, and let's not forget the lawn! So, our hoses get a lot of use when it's hot outside! 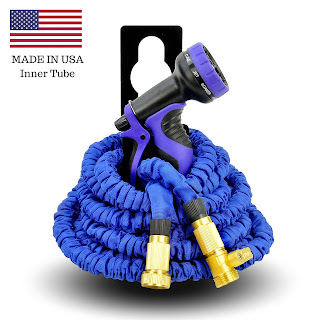 MADE IN USA INNER TUBE: This expandable garden hose is the strongest retractable hose in the market. Almost all expandable hoses have latex tubes which either burst or leaks (check reviews) after few weeks due to chemical reaction. We have replaced latex tube, with our MADE IN USA patented inner tube, which we guarantee will never leak or burst. For additional durability, our expanding hose has toughest 600D*600D Exterior Fabric available in the market, We welcome any tests. NEVER KINKS, TWIST OR TANGLES: Gardspo Expandable Water Hose is specially designed to be flexible yet durable. No need to unwind or untangle! LIGHT WEIGHT AND SPACE SAVER: Gardspo Expandable Flex Hose 50 Feet only weights 1.4 lbs, as compared to traditional hoses which weight more then 5 lbs, expanding from 17 ft to 50 ft with water pressure and shrinking in seconds to 17 foot when water is off. Drains itself and is perfect to carry anywhere, maintain tidiness and storage, specially if you have limited space. Ideal for your RV, trailer, boat, camping, etc. FREE BONUSES: High Quality Patented Spray Nozzle with 9 adjustable patterns for all your watering needs, + A Reel Hanger to store your hose and Heavy Duty Brass Connectors with high pressure Shut Off Valves and our unique protective rubber sleeve for additional protection against extreme water pressure situations that ensures no leaks ever. Unmatched durable quality and corrosion resistance! 30 DAY MONEY BACK GUARANTEE AND 12 MONTHS WARRANTY: Just contact them for no hassle refund or replacement. PROMOTIONAL SALE ON NOW! Have you tried an expandable water hose? This garden hose does sound really wonderful, and also made in the USA. I want to check into this one for sure! I always wondered if the expandable hoses worked well or not. We are in need of a new one. I might have to try this one out.